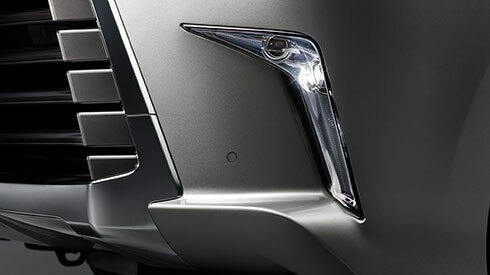 The next generation design of the distinctive 3-eye, energy-efficient LED lamps, which illuminate in a signature Lexus L-shape, flows seamlessly into the spindle grille to give the LX a bold fresh face. 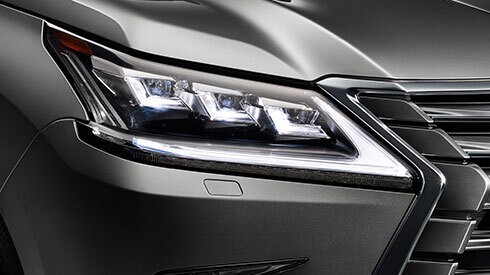 The L-shape signature is heightened by the integrated surface-emitting LED DRL (Daytime Running Lamp), and LED turn signal lamps that illuminate sequentially from the inner side to the outside of the headlamps. The Lexus signature is also seen in the thin L-shaped rear combination lamps, positioned high to complement the flowing design and enhance visibility for following vehicles. The turn signal lamps set between the chrome plated trim and tail lamps, illuminate sequentially from the inner to the outer side of the lamp to intuitively convey the turn direction. 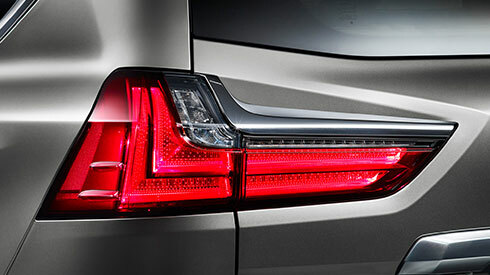 A sophisticated touch is surface-emitting LEDs in the tail and stop lamps, which appear to float when illuminated. 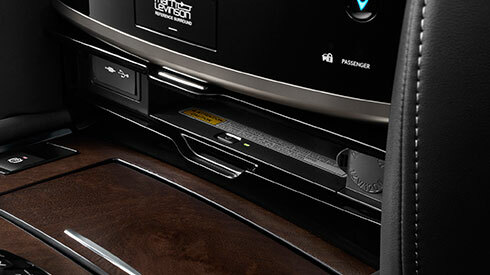 The thoughtful layout of the center console shows the human-oriented focus of L-finesse. Driving-related switches including drive mode select, Crawl Control and VSC are grouped together in easy reach of the driver for intuitive and natural operation, clearly separated from the independent grouping of comfort-focused switches for the driver and front seat passenger. 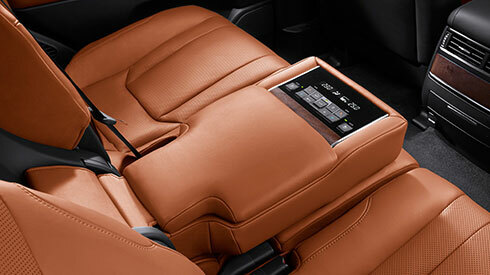 The layout of the switches and cup holders is optimized to enhance ease of use. Sophisticated details such as the metallic finish on control dials including for the audio system, and the use of white illumination for lettering on the switches that complements the subtle cabin lighting, deepen the feeling of luxury. 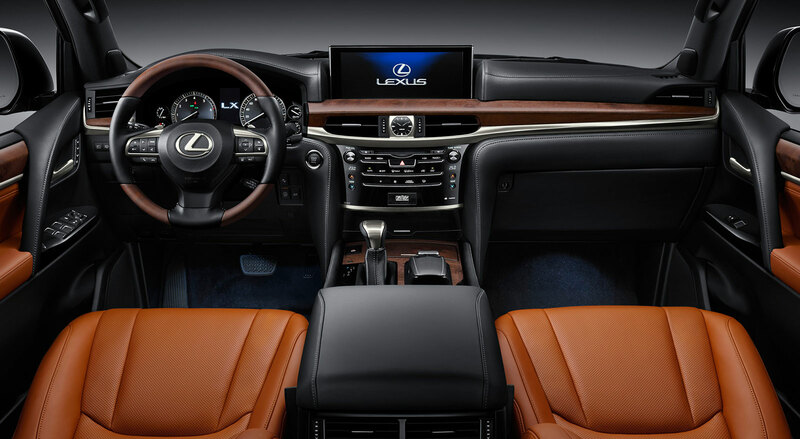 The Lexus Climate Concierge concept realizes a human-centered approach to individual comfort for the occupants of the front and outboard second and third row seats. 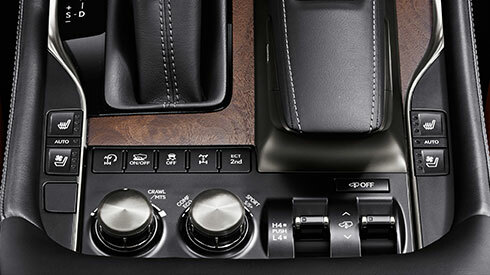 By simply pressing the Climate Concierge switch, the system coordinates with the 4-zone independent temperature controls to automatically control the cabin temperature, as well as the front and outboard second row seat heaters and ventilation that occupants come in direct contact with. This thoughtful charging tray in the center cluster enables wireless charging of batteries in Qi-compatible smartphones and electronic devices simply by placing them on the charger tray. Refined hospitality extends to intuitive operation of the front LED dome lamp and LED map lamps in the overhead console. Touch switches that detect finger proximity turn the appropriate lamp on or off. The lamps emit a sophisticated silky white illumination. 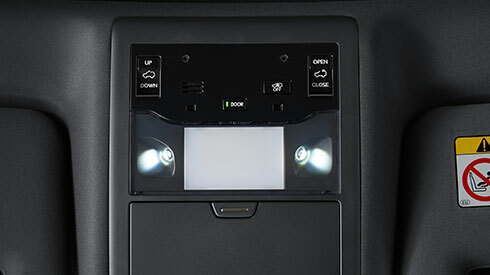 The entertainment system for second row seat passengers features large high-definition 11.6- inch liquid crystal AI (Artificial Intelligence) displays that automatically optimize the display contrast. The displays can be tilted manually to adjust the individual viewing angle. The center armrest in the second row seats is designed to provide supportive comfort, together with additional storage space. 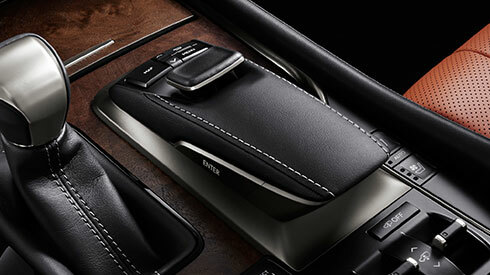 It also features climate control switches in fingertip reach, allowing outboard seat passengers to customize settings for their individual comfort. 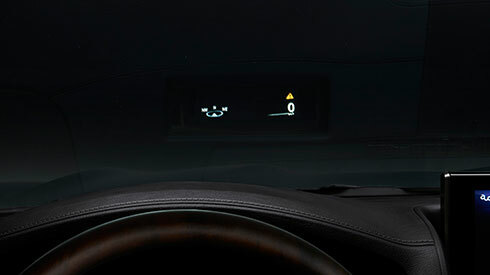 A high contrast liquid crystal display ensures clear readouts of settings. 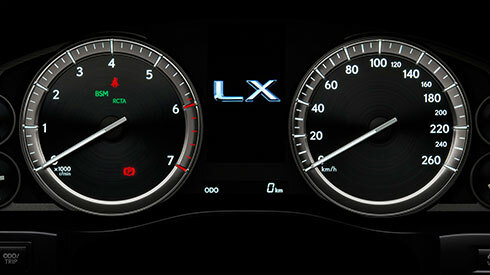 The LX’s triple-linkage multimedia system supports the coordinated display of information on the large 12.3-inch EMV (Electro Multi- Vision) display in the center of the instrument panel, the 4.2-inch color TFT (Thin Film Transistor) multi-information display in the meters, and a large color head-up display on the lower windshield glass. 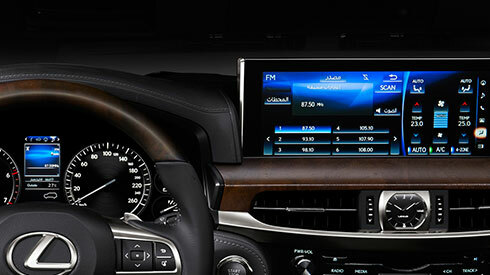 For convenience, audio system information, incoming mobile calls, and some navigation on the EMV display can also be displayed on the multi-information display, and controlled using switches on the steering wheel. The large analog Optitron tachometer and speedometer ensure excellent visibility for reading vital information in a glance. The radial dial design, three-dimensional feel of the scale indicators, silver ornamentation of the scale rings and hairline finish of the outer rings exude premium quality. 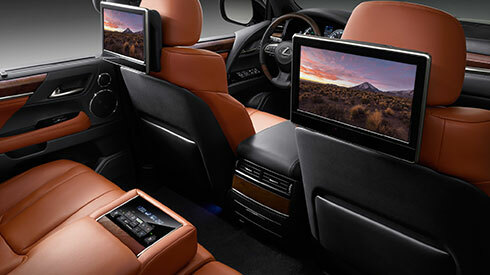 The 19-speaker Mark Levinson Reference Surround Sound System delivers home-theater quality in-car entertainment. 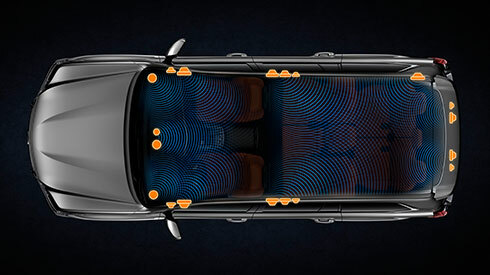 A 3-way speker system in both the front and second row seats creates a 7.1-channel configuration that supports 5.1-channel playback, realizing a three-dimensional sound field with exceptional audio quality.